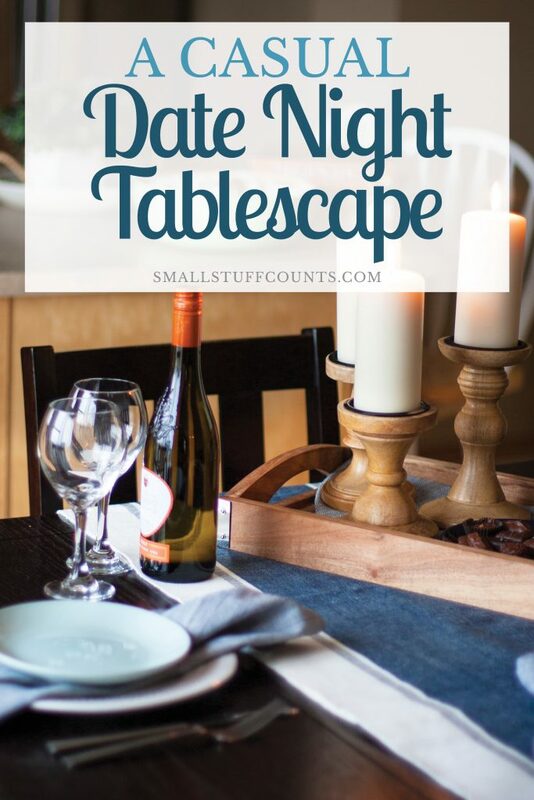 Do you have any date night traditions? David and I are homebodies through and through, so a cozy night at home is the perfect way to unwind and enjoy time together. And date nights at home are a must with a newborn in our house and below zero temps here in Iowa lately! Wayfair asked me to share how we enjoy a night in, so today I’m sharing one of our favorite ways to spend an evening at home. Being more intentional about the time we spend together is a big goal of ours this year, and we’ve designated a couple nights a week as official date nights in our house. You may be in a similar boat to us where you and your significant other have fallen into a rut of watching TV together night after night. We LOVE a good Netflix binge, but we also want to put a bit more effort into some of our date nights and do other things that are fun and spark more conversation than sitting shoulder to shoulder in front of the TV. Neither of us enjoy cooking, so an ideal date night for us is going out to eat. Now that we live in a bigger city, there are tons of new-to-us restaurants we want to try! 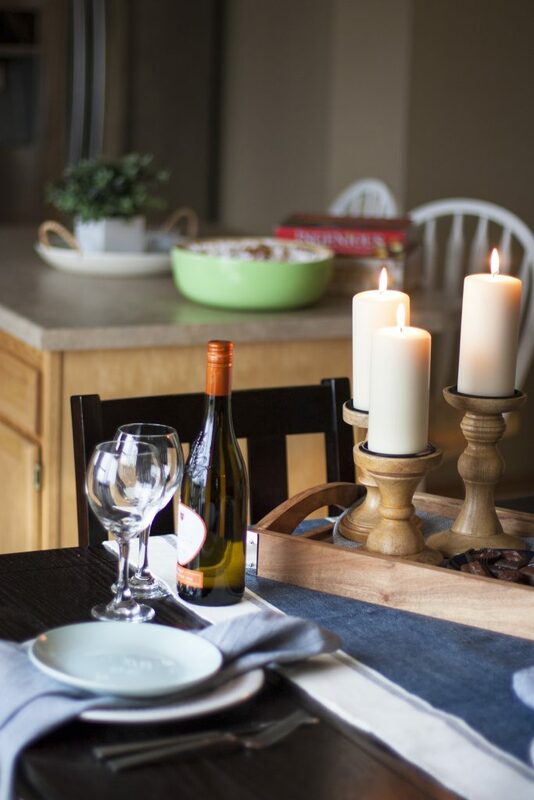 Since it’s so much easier to bring takeout home with a baby in the house, I’m planning to put more effort into our table decor for date nights so we can enjoy a night in with good food and a pretty table. Taking just a few minutes to add some extra touches to the table elevates date night to something more special than our usual dinners and sets the tone for an enjoyable night in. 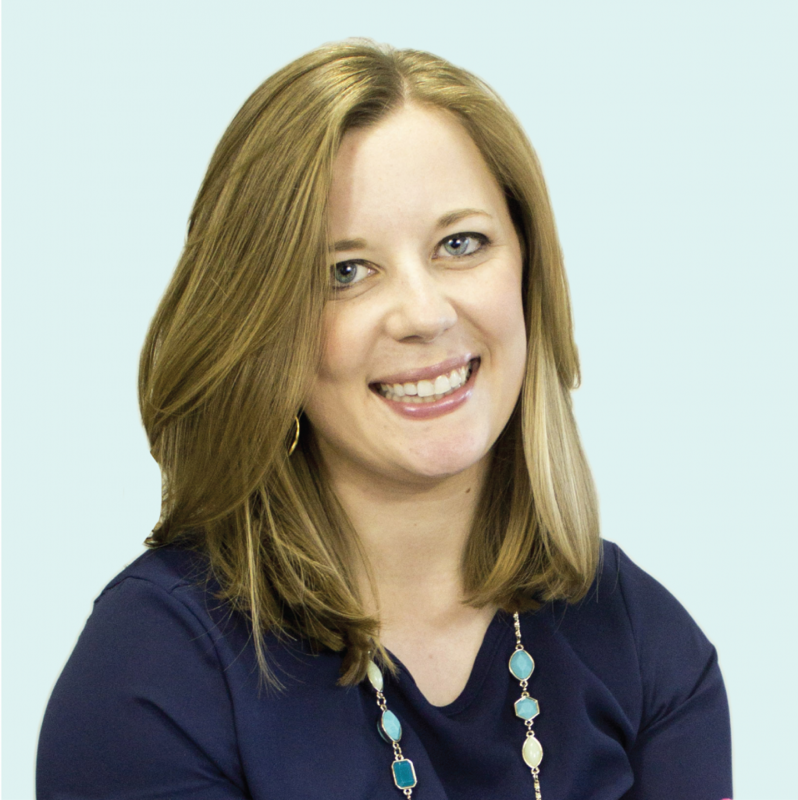 This is a sponsored conversation written by me for Wayfair. See my disclosures here. 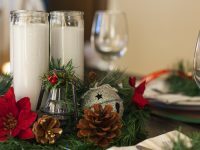 This casual tablescape is nothing fancy and can be set in a couple minutes. David will typically pick up the food from a nearby restaurant which gives me a few minutes to clean off the table and make it pretty for our date night. Eating off of pretty dishes can make even the cheapest takeout a lot more exciting! 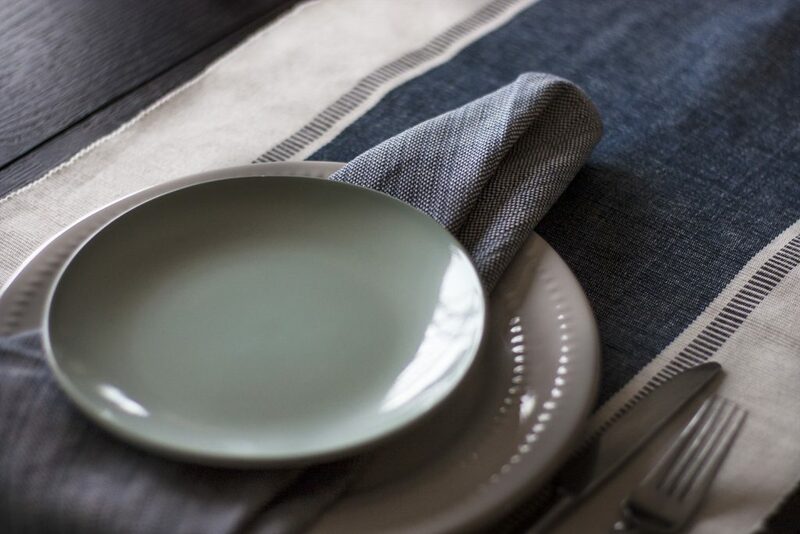 We don’t normally use cloth napkins, but I really want to start.There’s no sense in storing pretty things for a special occasion – they’re meant to be used! Don’t cloth napkins make a meal feel special? They certainly do to me. 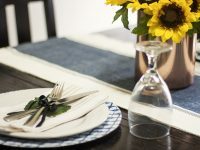 For this casual tablescape, I used white dinner plates, aqua salad plates and blue-gray napkins. I have no idea how to fold napkins in fancy shapes, but I prefer a laidback look anyway. After a little experimenting, I ended up holding the napkin in the air near a corner and sort of folding it in thirds. I placed them under the salad plates with the point facing up. It looks nice and seriously took me two seconds. 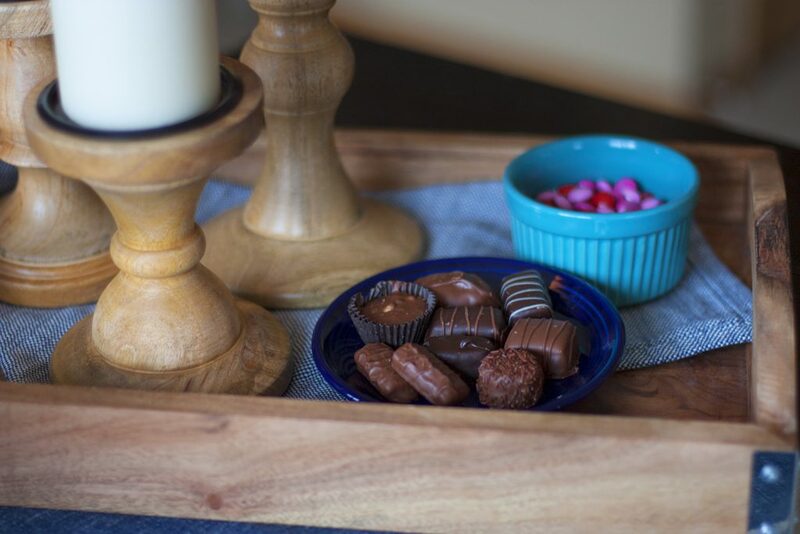 Instead of a fussy centerpiece, I added a few pretty and yummy things to a wooden tray. These wooden candle holders are one of my new favorite decor items because they will go with everything and I can use them in any room for any season. 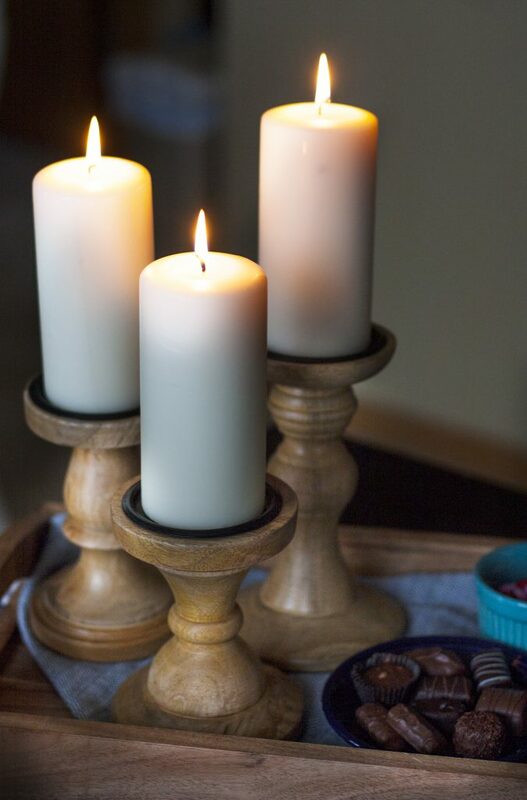 Candles are always a good way to add ambiance and are perfect for setting the mood for date night. I filled the rest of my tray with chocolates, because why not? We love trying different chocolates! One of my best tips for creating a casual centerpiece is to use a tray as your base. Trays pull everything together and make cleanup easy. A fun night in for us is dinner (preferably dinner we didn’t have to cook) followed by board games. We both love playing board games and have a very large collection. I’m determined to play games together more often this year since it’s an activity we can do at home and we can easily take breaks when Chloe starts crying. Plus, board games are cheap entertainment! 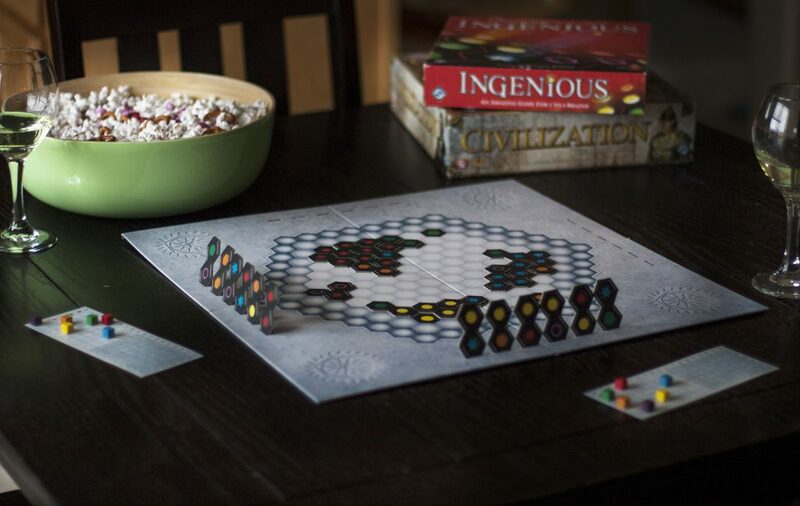 We shared our favorite board games for adults in this blog post if you want suggestions – we literally have a closet stuffed full of them! 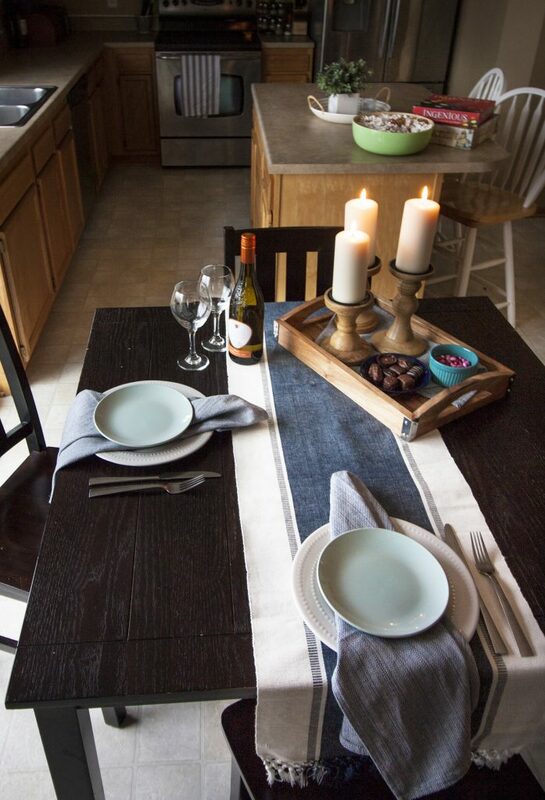 Keeping our table setting simple means we can clean up quickly and dive right into a night of fun board games together. 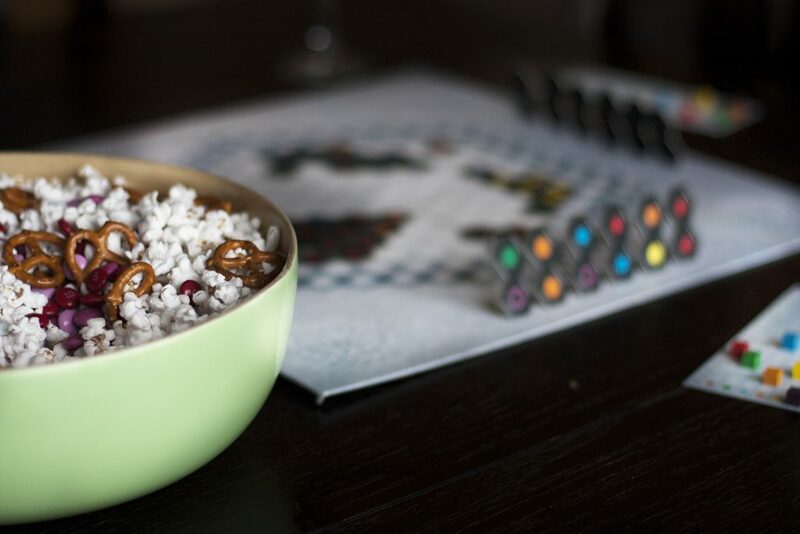 I think wine and popcorn pair perfectly with board games ;). We don’t like to get our board games messy so no-mess snacks are a must! I recently discovered that kettle corn mixed with chocolate candies and pretzels is the absolute perfect sweet and salty combination. I love like to serve popcorn in pretty bowls, like this mint-colored bamboo bowl from Wayfair. 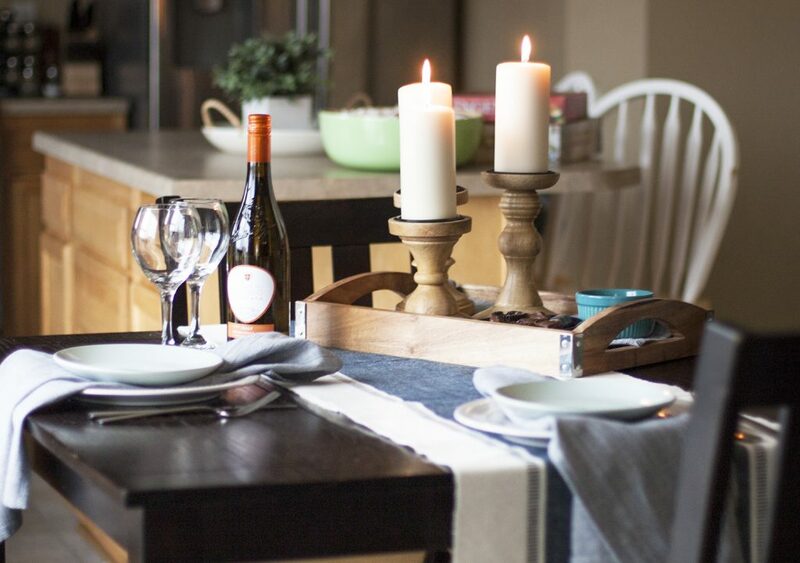 Get this look yourself with the following casual tablescape items from Wayfair. I’ve linked to the exact or similar items to the ones I used in the list below. 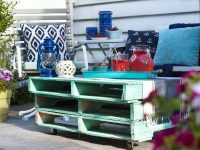 For more decor items, visit Wayfair.com. 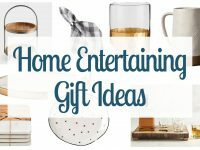 (Here are links to some specific product categories you’ll want to check out: Candle Holders, Cloth Napkins, Serving Bowls). 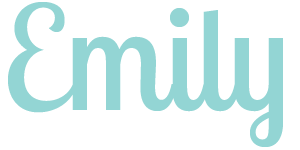 What are your favorite date night traditions? I’d love to hear!